Originally I had not intended another post about ducks, but a comment by a reader on the previous post regarding the Sampson duck farm in Lakeville prompted me to consider the history of duck-raising at East Middleborough to which the reader refers. 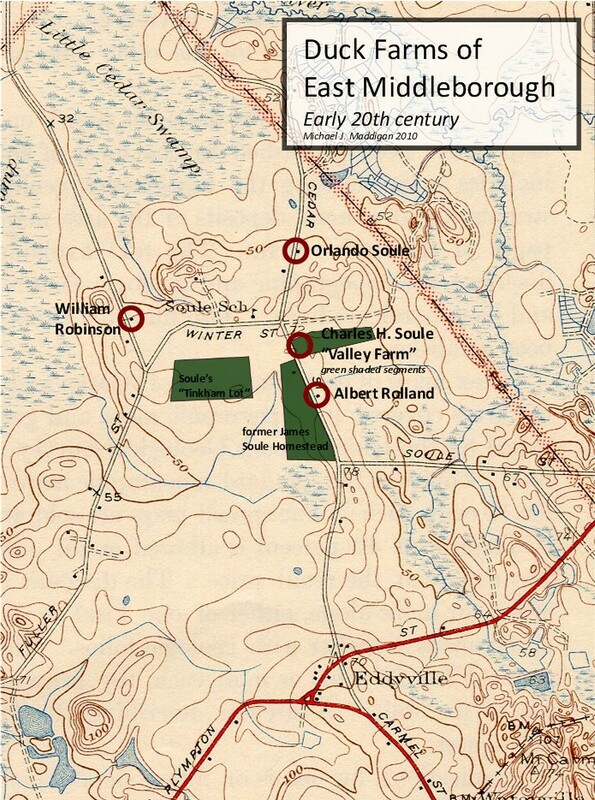 What the reader describes in his comment are the remains of Valley Farm, the duck farm of Charles H. Soule (1871-1948). 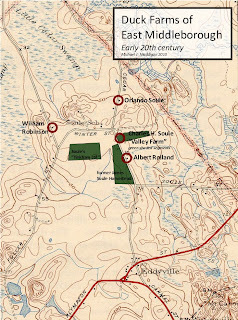 In 1963, Soule’s daughter, Alberta N. Soule described the ruins of the farm which even then was returning to forest. There is a short lane off Cedar street in East Middleborough (between the home of Mrs. William Kelley and that of the late Edwin E. Soule) where there are tumbled down buildings and traces of what at one time was a thriving business. The remains on an incubator cellar would tell one that it was the site of a poultry business perhaps, but it would be difficult for one who didn’t know the history to visualize the large duck farm that was operated on those eight acres of land. It is now all grown up to scrub oak, pine, and maple with a slight clearing through the center part of the acreage. The duck farm which occupied the site was established in 1899 when Charles H. Soule acquired the former homestead of James Soule on the west side of Cedar Street just north of Soule Street as well as an eight-acre woodlot on the opposite (east) side of the road. Soule had previously engaged in duck-raising at his father Orlando Soule’s home, the distinctive brick house which stands further north on Cedar Street, and it was on the newly-acquired eight-acre woodlot that he chose to establish his own business. To do so, Soule cleared the wood from the lot, and relocated a former blacksmith shop from the James Soule homestead. [The blacksmith shop] was moved across the street and down the lane to be used for a grain shed and picking house. Later a larger building was added on top of which was a large tank building holding hundreds of gallons of water to be used all through the farm. A windmill arrangement was first used for pumping water, but sometime waster had to be pumped by hand to supplement that amount. Later a gasoline engine and an artesian well were installed. Water was provided for the ducks through a pipe system laid all through the farm with a faucet arrangement in each pen through which the water was turned on three times each day to fill the troughs. A large horse-drawn low cart was the feeding vehicle. Several hundred pounds of ground grains and meat plus chopped cornstalks or cooked mangle beets were mixed with water and hand-mixed with a shovel and taken in the cart to be shoveled out to each pen three times each day. Grain was bought by the carload and delivered at the East Middleborough Railroad Station. Grain was also delivered twice a week from local grain merchants in large grain trucks drawn by four horses. Mangle beets were bought by the ton from the Bridgewater State Farm and cooked in a huge iron vat. Field corn, raised on the farm, was cut while young and fed through a corn cutter to cut pieces about an inch long. These two ingredients provided the green in the feed which the ducks needed. Each summer my father raised and marketed from 12,000 to 15,000 ducks, shipping them by express each day from the East Middleborough Station to Boston. James D. Legg, Thorndike & Gerrish, and Adams & Chapman were some of the markets in Boston with whom he did business. Three to four pickers were employed all through the picking season. After picking, the ducks were placed in large barrels with plenty of ice, and early the following morning they were packed for market. The poultry arrived in Boston for market the morning after it was dressed. The incubator cellar on the Soule farm would have housed the hot water mammoth incubators mentioned by Alberta Soule, although the term "cellar" is somewhat misleading as often incubator cellars were built partially or even wholly above ground. It is likely that one of the concrete slab foundations mentioned in the reader's comment on the previous post is the incubator cellar foundation, such foundations being typically of poured concrete since great amounts of moisture were employed in incubating the eggs and which would have quickly rotted a wooden floor. Other buildings on the farm would likely have included brooder houses, fattening houses, a feed storage house or barn, and the picking or killing house previously mentioned where the ducks were prepared for market. Water, as noted by Alberta Soule, was vital for the farm's operation, required in the incubator cellar and brooder houses for heat, the picking house for processing, and as a water supply for the ducks. The Middleboro Gazette left a record of duck-raising from this era in its pages in 1905 which reinforces the picture provided by Alberta Soule. In 1950, Soule’s daughters, Alberta N. Soule, Marion S. Griffith and Mildred A. Soule sold the former duck farm. Soule, Alberta N. “Three Blacksmith Shops, a Brick Yard and Shoemakers’ Shops in Soule Neighborhood”, The Middleborough Antiquarian, 4:3, June, 1962, 6. Thank you so much for the detailed history lesson. We all live "somewhere". I live here. You've given me a greater connection to my land. This lot was so overgrown when I first saw it that even my engineer did not identify the man made foundations. He did comment several times that excavated soil materials "should not be here", "..not what I expect". Alberta's memories are verifiably accurate. The 24x60 "foundation" is the incubator cellar. It is in about the center of the lot.It is about three feet into the ground, two feet out of the ground. It has a flat stone floor. It is littered with the rusted remains of a grid of iron piping, valves and gauges, now obviously, for heat transfer. I haven't yet identified an actual furnace site and there's no accumulation of ash, an ash dump, though there are several small ash sites and "trash" sites. The slabs of the duck houses are to the east and to the west of the incubator, built close to and in line with the lot line. I now can identify the "blacksmith shop" site and the deep well. I've excavated interesting materials including leather harness and belting. I can identify the original pathways and pipelines. The Con Com had me replicate some wetland. I wish they hadn't. My excavator disrupted so much of the original "prime operations site". Historically speaking. I did more harm to the site than good. The excavation of the "pond site" intrigues me. It's so large that the botanist who walked the land thought it was natural, but commented it was "odd" We had no idea at that time that it was not natural , but living here, I've found the piping "through" the hill. I would think it had to have been excavated by a steam shovel, but, given enough time, men and horses could also do it. I thank you again for your wealth of information which you so courteously share.